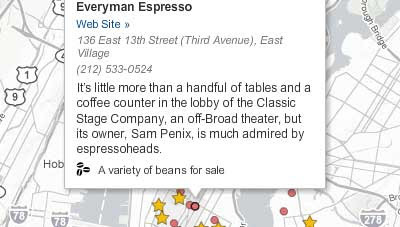 The New York Times have created a Google Map to show the places in New York serving the best coffee. Included on the map are outstanding coffee bars that produce extraordinary coffee at the highest standards, day after day. It is possible to search the map by address or Zip code. The information windows for each coffee bar includes a review, an address and a link to the bar's website.